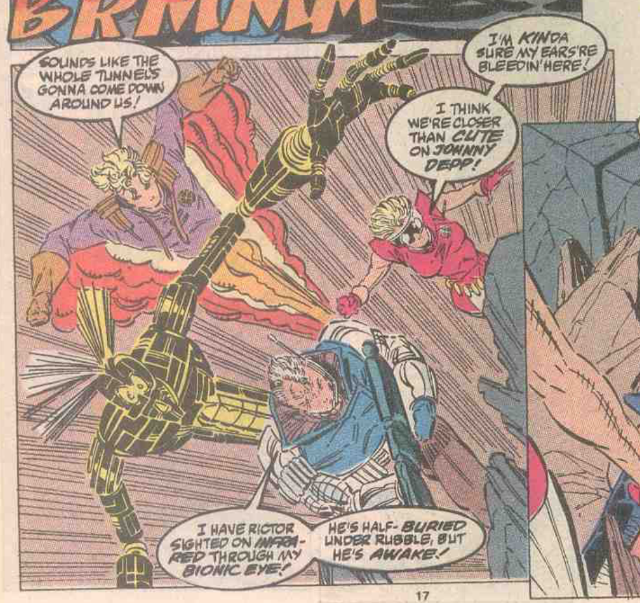 The New Mutants rescue Rictor amidst Caliban and Sabretooth's battle. Rictor watches as Sabretooth and Caliban savagely fight in the Morlock Tunnels, overcoming his fear to attack Sabretooth on Caliban's behalf. 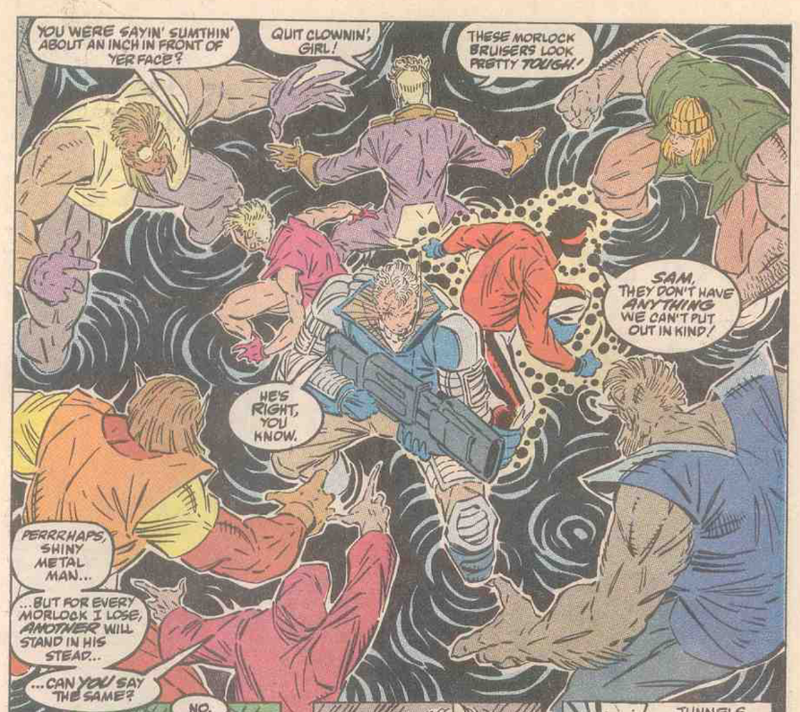 Meanwhile, Cable leads the New Mutants through the tunnels, and they run afoul of Masque and a group of Morlocks. 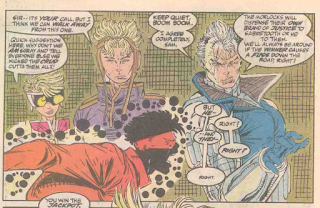 But Cable convinces Masque to allow them to pass, and they quickly manage to track down Rictor. Seeing Rictor injured, they attack both Caliban and Sabretooth, knocking out the former. But Sabretooth manages to escape with Rictor in tow. 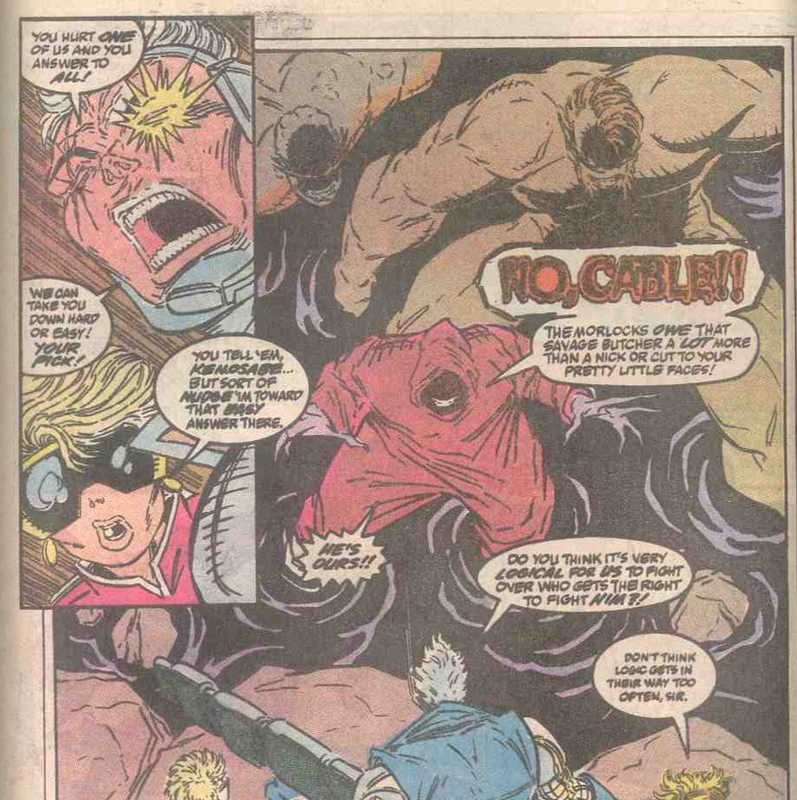 When Sabretooth threatens to kill Rictor for intervening in his fight with Caliban, Rictor fights through his injuries to trigger a massive earthquake that brings the tunnel crashing down, drawing the attention of the New Mutants. They manage to pull Rictor from the rubble, but Sabretooth escapes as well. Just as the New Mutants prepare to attack him, Masque appears, declaring Sabretooth's fate belongs to the Morlock. 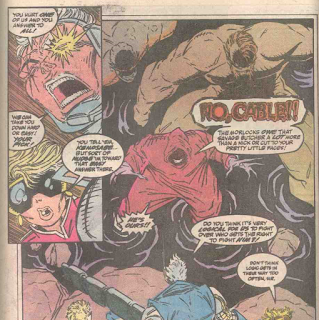 Cannonball and Cable, to Sunspot's outrage, agree, but before the Morlock's attack, Caliban appears, declaring no more will be killed by Sabretooth. 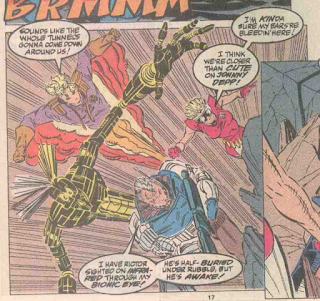 They resume their battle, and with the New Mutants watching, Caliban seemingly kills Sabretooth. Later, Rictor is recovering and still not thrilled about Cable, and when he goes to the Danger Room to practice, he finds Cable using it. Impressed by his skills and realizing he isn't asking anything more of the New Mutants than he expects from himself, Rictor starts to think maybe Cable's way isn't so bad, and that while he still doesn't like or trust him, he's beginning to respect him. Fabian Nicieza, who will take over scripting duties on the series from Simonson entirely after "X-Tinction Agenda" on his way to becoming one of the chief architects of the X-Men in the early to mid 90s, fills in as scripter on this issue. Caliban, who's been something of a fixture in Simonson's titles of late, disappears for a bit after this issue, not turning up again until the start of "X-Cutioner's Song". 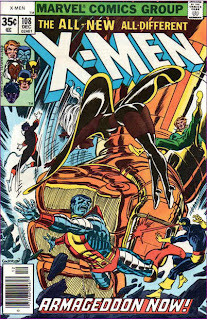 Masque, his profile similarly on the rise of late, appears leading a group of Morlocks (ones significantly more brutish than the group of grotesque X-Men doppelgangers appearing in contemporaneous issues of Uncanny). He will become a recurring antagonist for this iteration of the New Mutants and X-Force. This marks the first time Masque and Caliban have seen one another since the aftermath of "Mutant Massacre", when Masque went back into the tunnels, and Caliban's transformation by Apocalypse. The next issue blurb teases a story set in Madripoor, though that story won't actually begin until issue #93, with next issue instead handed over to a fill-in inventory story involving Skrulls. In the tunnels, Rahne is tracking Rictor in her full wolf form, yet Cable is somehow able to communicate with her despite Dani not being around to relay. Cable notes that the New Mutants' teamwork is sloppy. Later, he backs up Cannonball's assessment of the situation, an early hint at their eventual relationship. It's implied that during their fight, Caliban breaks Sabretooth's back, killing him. Though, of course, he'll turn up alive and well eventually, which, of course, makes sense given his healing factor. Rahne finally tells Rictor to shut up about Cable, saying he can't expect the rest of the New Mutants to back him up when he won't even tell them *why* he doesn't like Cable. But watching Cable train in the Danger Room, Rictor develops a grudging respect for him, putting his (still unrevealed) beef with him aide. Boom-Boom dials up the 90s slang in this issue, declaring "no problema" at one point, and calling Cable a bohunk at another. She also praises the cuteness of Johnny Depp. 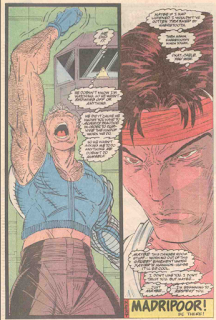 Rictor gains and loses a white tank top throughout the issue, and his guts, which the narration and his internal dialogue refer to as being "shredded" by Sabretooth, appear undamaged throughout the issue. Backgrounds continue to slip, with much of the action in the tunnels playing out against white or heavily hashmarked backdrops. Cable's bionic eye is revealed to have infrared capabilities. Bringing to a close this little two part transition tale setting up the New Mutants' new status quo, this issue gives the team a new set of antagonists in the form of Masque's Morlocks and brings to a close (or at least sets to simmering) the Rictor/Cable conflict. While the latter is resolved a bit quickly and, in retrospect, a bit oddly - in light of what we later learn Rictor's beef with Cable to be, it seems strange that just watching the man he believes killed his father workout in the Danger Room would be enough to convince him to continue working with said killer - for the most part it works with what was setup in the previous issue. Plus, of the remaining X-Terminator recruits, though Boom-Boom's made an impression in the series just on the strength of her personality, Rictor, some pinning for Rahne aside, has mostly faded into the background since joining the team (and he wasn't exactly a focal point as part of X-Factor's supporting cast previously, usually getting muscled out by Rusty and, again, Boom-Boom), so it makes sense to build this two-parter around him by making him the lens through which the kids' reactions to Cable are focused. But of course, as was lamented last issue, as effective as this story is at setting up the book's new status and as nice as it is to finally give Rictor the narrative spotlight AND a role in an ongoing mystery (soon to be the X-books bread-and-butter! ), it's hard to get too excited about any of this, given how soon it will all be replaced with something else entirely. Tomorrow, psychic Ravens attack in X-Factor #56. Next week, Uncanny X-Men #264 and Excalibur #24. There's a new Mary Sue in the town now. @Teemu: There's a new Mary Sue in the town now. I actually chalk it up more to some combination of Simonson/Nicieza/Liefeld forgetting that when full wolf, Rahne can only communicate telepathically with someone who can understand animal thoughts than an attempt to further Mary Sue Cable. As presented, it's not like a big deal is made of Cable being able to understand Rahne; it's more like Cable says "Rahne says go over there!" and I say "hey, wait, Rahne can't talk when she's a wolf and Dani is gone!" Well it was a joke mostly, albeit one of them with a harsh truth in it. My original response was in line of "It's that ol' Grey telepathy", which is curious considering he's no Summers-Gray yet. Didn't think of the full wolf aspect though. And my original original thought was that she obviously has a radio in her GPS dog collar and she's growling according to Cable's previous instructions into it. Cos he's like totally awesome and forethinking like that. Well, the art provides the usual barrel of laughs. 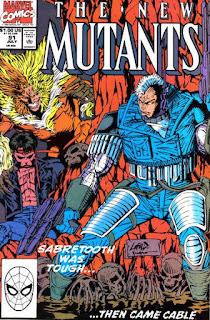 You know from that cover alone (Sabretooth's hair, yikes!) we're in for a craptacular ride, artwise. And this issue does not disappoint. "a group of Morlocks (ones significantly more brutish than the group of grotesque X-Men doppelgangers appearing in contemporaneous issues of Uncanny)"
The Morlocks become very bland under Liefeld. With the exception of Masque and a few hairy catwomen, they're all mostly muscle bound brute-types with a combination of mullets, mow hawks, and bushy sideburns. 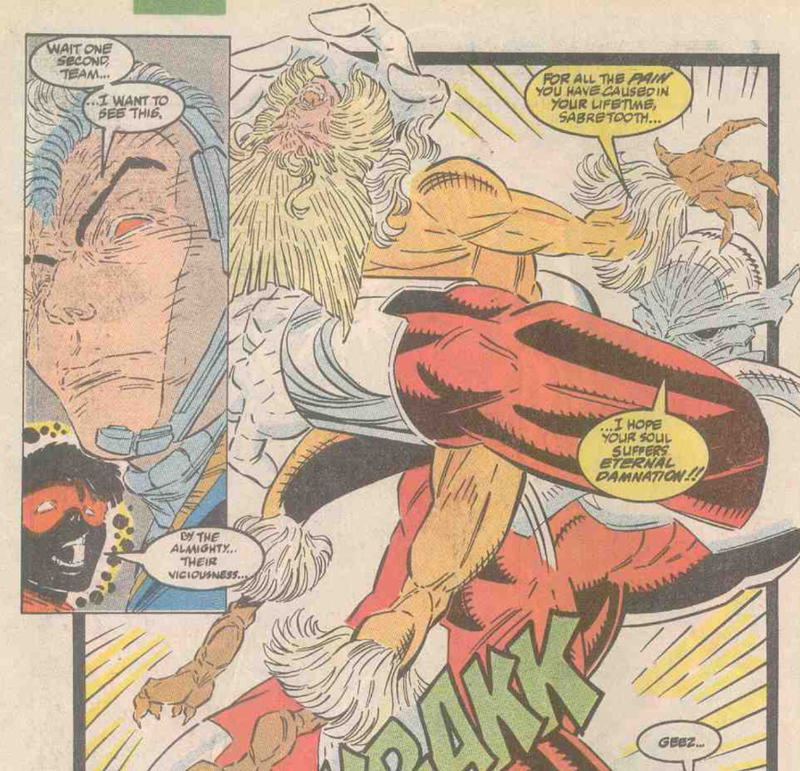 "It's implied that during their fight, Caliban breaks Sabretooth's back"
That panel has to a contender for one of the worst examples of art in this issue. "Rahne finally tells Rictor to shut up about Cable, saying he can't expect the rest of the New Mutants to back him up when he won't even tell them *why* he doesn't like Cable." Someone needs to tell Rahne to shut up, because she is actually making sense and well, that doesn't belong in this title! Kidding. But yes, it does make Rictor look like an idiot if he won't reveal the reason why. I wonder if Liefeld & Simonson had already worked out that back story by this point, or just introduced it for the sake of having some type of mystery? "But watching Cable train in the Danger Room, Rictor develops a grudging respect for him"
Ok, maybe I am being a little bit harsh. If nothing else, this era does have a certain nostalgic charm to it, and much like Uncanny at the time, it certainly is an interesting era for the title, especially when looking back it from our current perspective. I like the part when Sabretooth stands around while the Mutants and the Morlocks argue about who should fight him. I'm also not a big fan of Wolverine's archnemesis being "killed" by a secondary character that no one cares about. Caliban looked like he had his mouth closed whenever he talked in this story. wwk5d: That panel has to a contender for one of the worst examples of art in this issue. Ow-aa, the one time Rob has an excuse: of course he looks contorted, his spine has just been broken. Jeff: a secondary character that no one cares about. Hey...! Caliban when written by Claremont was a character you did care about. I did, at least, enough to be questioningly positive even when Rob warpathed him up and turned him totally different character. It was Rob, right, he didn't pop up anywhere post-apocalypsed at any point before this, right? I’m with Jason. The fact that everyone stands around deciding whether they’re going to battle to the death, and with whom, is hilarious. Okay, Nicieza almost certainly scripted Marvel-style over Liefeld’s pencils rather than type up a script for Liefeld from Simonson’s plot. If Simonson is credited as plotter, though, and Liefeld only as penciler rather than co-plotter/penciler, are we to believe that Liefeld really added so little to the verbal or written plot that Simonson gave him? ‘Cause that doesn’t gibe with the assumption I’ve been (and I think we’ve all been) making that Simonson and Liefeld were conferring on plots, with Liefeld then mapping out the story beats as usually happens Marvel-style, and of course Simonson having to work around not just the awkward poses or unclear action or added characters but more substantial details Liefeld was throwing into the story. Not under his leather vest, either, but in place of it! 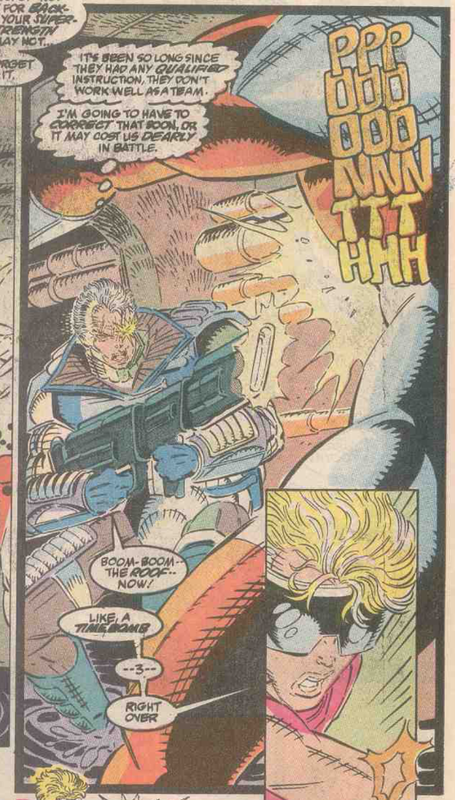 Meantime, Nicieza has Rictor’s thought bubble refer to Cable as ”Mahatma Patton”. I don’t get any kind of spiritual vibe off Cable, especially of the nonviolent Gandhi-esque variety — and, let’s be honest, that’s where Rictor heard the term, if anywhere, same as most readers. @Teemu: And my original original thought was that she obviously has a radio in her GPS dog collar and she's growling according to Cable's previous instructions into it. Cos he's like totally awesome and forethinking like that. Heh. That's a pretty good No Prize explanation. It was Rob, right, he didn't pop up anywhere post-apocalypsed at any point before this, right? Nope, we've seen him post-Apocalypse transformation prior to this, in X-Factor (#50-52, notably, when he fought Sabretooth and Archangel there, amongst other things). Rob certainly puts his own unique spin and takes things to the, ahem, extreme, as is his wont, but the idea of a bulkier, more savage Caliban is not his. @wwk5d: The Morlocks become very bland under Liefeld. Indeed. And even the catwomen just seem like female variations on his brutish, quasi-animalistic generic Morlock men. I wonder if Liefeld & Simonson had already worked out that back story by this point, or just introduced it for the sake of having some type of mystery? I'd like to think the former, but I suspect the latter. @Jason: I like the part when Sabretooth stands around while the Mutants and the Morlocks argue about who should fight him. It's pretty egregious here, but that's not too far removed from a genre convention. That Sabretooth is involved makes it a lot of worse, though. @Jeff: I'm also not a big fan of Wolverine's archnemesis being "killed" by a secondary character that no one cares about. I agree, though I'm not even sure we're supposed to read it all that seriously. I mean, we see them fight, the dialogue tells us its vicious, and then there's a panel of Sabretooth lying prone with Caliban triumphant. The implication is that Sabretooth is dead, but it's never explicitly stated, and even at this point, long time readers have seen Sabretooth come back for worse. So it's entirely possible we're supposed to read it less as "OMG Caliban killed Sabretooth, that's the end of him!" and more like "Sabretooth is dead, just like when other villains disappear during a fight or fall down a chasm but no body is discovered and they stay dead, wink". He shows up next, relatively soon, in WOLVERINE #41; I've never read that issue but I'm curious if they address his "resurrection" there. @Anonymous: Caliban looked like he had his mouth closed whenever he talked in this story. Yeah, I'm not sure if Liefeld is just working off a bad reference, or decided to go nuts with the look of the character, but it seems like he thinks Caliban has, like, a skull head at times. It's weird. @Blam: If Simonson is credited as plotter, though, and Liefeld only as penciler rather than co-plotter/penciler, are we to believe that Liefeld really added so little to the verbal or written plot that Simonson gave him? It's very unclear who's doing what here, and throughout this era of the title. It's generally accepted/said that Liefeld was essentially the co-plotter at this point, yet he never shares actually shares that credit with Weezie in any of the issues' credit boxes (his first plotting credit comes in #98, after Simonson has left the book). Despite that, his influence was enough, either directly or through Harras, to get Weezie to walk, but I'm not sure at what point its decided who gets credited with what. Did he and Weezie hammer out the plots together, and he just eschewed credit for it in the issues themselves? Or was he the co-plotter in that Louise would give him a Marvel style script, he'd use or ignore it as he desired and then just draw his own thing, with Harras backing him up? Basically, I have no idea whether he was ever an "official" co-plotter with Simonson or just a de facto one, given his popularity and the backing of editorial, with the issue credits and popular perception seemingly in conflict on the matter. You could just assume Cable and the others stop when they reach her, though, and he’s simply the one stating the obvious out loud; there needn’t be any communication between the panels. My issue basically boils down to my (somewhat snarky) response to Cable saying "Rahne's picked up Rictor's scent!" being "how does he know that, exactly?" She can't tell him that verbally, because she can't talk in wolf form, and she can't tell him that telepathically, because we don't know Cable is a telepath yet/even if he was, it's unclear if normal telepaths can even communicate with Rahne when she's in wolf form. Had Cable said "Rahne says Rictor's thataway!" I could chalk it up to a between-panel action in which Rahne, say, turns left instead of right and Cable correctly reasons she's following his scent in that direction, or even if he'd just said "I think Rahne's got his scent! ", it would leave it open to him interpreting Rahne's non-verbal actions. So I guess my problem is really with the scripting, in that I'm not sure how Cable could non-verbally tell the difference between Rahne running through the tunnels searching for Rictor's scent and Rahne running through the tunnels because she's following it, unless they'd established some kind of signal off panel in which three bobs of Rahne's wolf head means she has the scent, or some such thing (as Teemu suggested), which does make for a nifty No Prize explanation but still doesn't change the fact that the line is problematic in its specificity. Teebore: Nope, we've seen him post-Apocalypse transformation prior to this, in X-Factor (#50-52, notably, when he fought Sabretooth and Archangel there, amongst other things). You know, I had this haunting feeling that we did already see him bulked up and even that I was thinking then that "it wasn't Rob then after all". But in some sort of momentary lapse or weakness I didn't go look it up prior asking. I certainly did read the X-aminations for the said issues, but registered it only partly. The looking up before commenting is actually a somewhat non-easy concept for me, because I consider it kind of a matter of honor that especially with the issues that I own and have back in the day read and reread and reread and... the initial commentation happens purely on my memory backlogs. I certainly didn't waste those countless hours of childhood for nothing to show! ... and I kind of did buy Sabretooth dying back then. It was still the times when an audible snap from someone's spine regions still meant something, and I never really was a fan of his anyway. Like, dying for a time being, but certainly not never to return. Wolverine too kind of killed him in San Francisco once by ramming his claws into Sabre's guts, or at least got one of those death blurbs out of him. And Ripper of course, Colossus killed him loud and clear, but he too was back like the Marauders often do. Would it be totally out of question that this is again one of those inferior Sabreclones and he actually was put down properly here and the body was eaten by alligators afterwards? "Boom-Boom dials up the 90s slang in this issue, declaring "no problema" at one point, and calling Cable a bohunk at another." Yeah, I generally like Fabian Nicieza, but boy did he embrace the 90s something fierce! 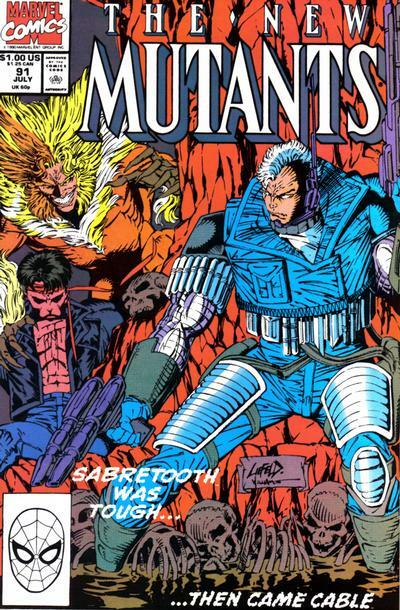 Seriously, read X-force, New Warriors, and Nomad and you'll notice some of them get really "Gen X-y"
Also the art for this issue was really bad, even by "Liefeld standards." 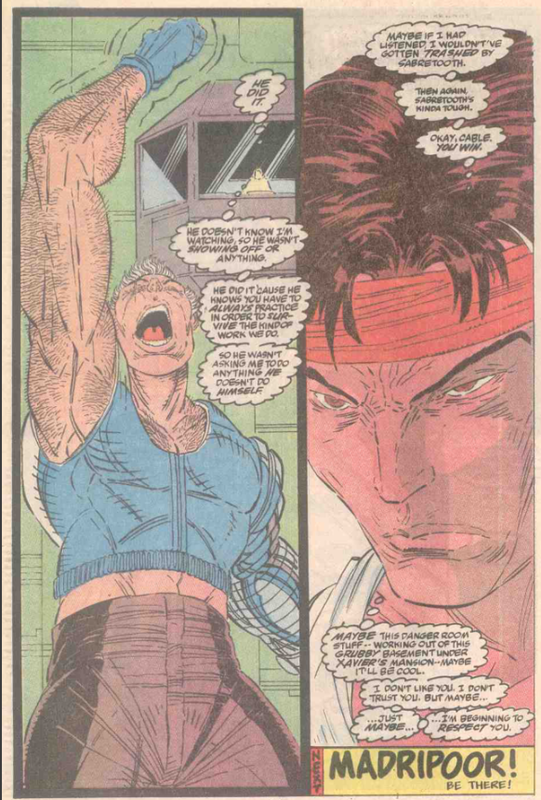 Even after drawing it for 5 issues now, Liefeld couldn't remember what Rictor's outfit looks like? Also I didn't know that Apocalypse also gave Caliban the ability to grow three sizes in one panel. Or speak with his mouth (apparently) sewn shut. @Teemu: Would it be totally out of question that this is again one of those inferior Sabreclones and he actually was put down properly here and the body was eaten by alligators afterwards? Oh yeah, if we're running with the "almost all the Sabretooths we see are clones of the original" theory, this one was definitely a clone. @Jonathan: Yeah, I generally like Fabian Nicieza, but boy did he embrace the 90s something fierce! Seriously, read X-force, New Warriors, and Nomad and you'll notice some of them get really "Gen X-y"
Yeah, I think some of that even seeps into his X-Men work. Though I didn't realize he wrote the 90s Nomad book. I might have to check that out sometime.